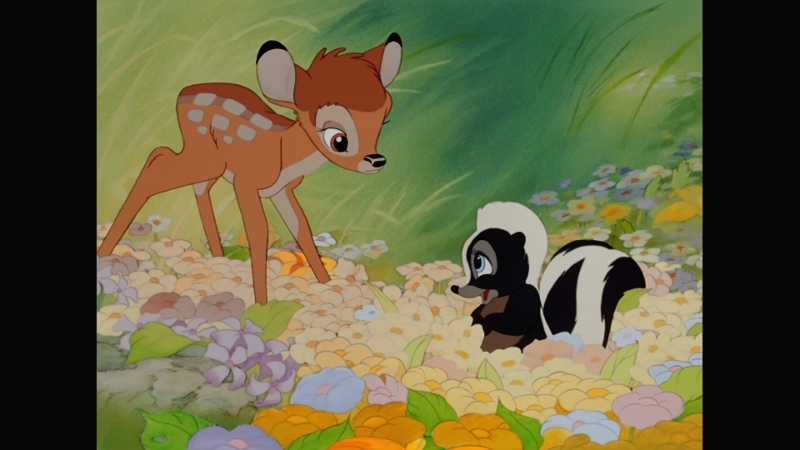 Based on Felix Salten's 1923 novel, Disney's landmark Bambi (1942) still lies near the top of their resume after three-quarters of a century. Running a scant 70 minutes long, Bambi wasn't their shortest film to date---that honor goes to Dumbo, released one year earlier---and it had an even lower budget than its predecessor, but unfortunately didn't perform as well at the box office during its original run. In fact, Disney's feature-length animated film production was suspended shortly after, as they re-issued their earlier films and temporarily halted development of projects like Alice in Wonderland and Peter Pan for the better part of a decade. Blame World War II and Fantasia. 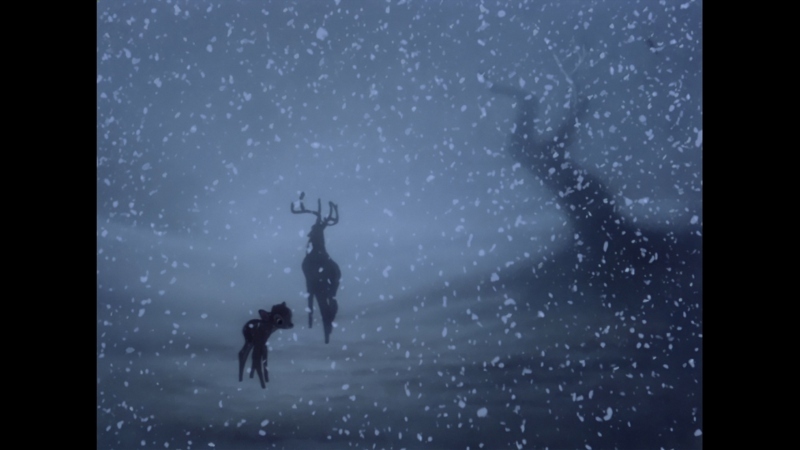 Directed by animator David Hand (whose only other full-length credit was Snow White), Bambi was pitched, put on hold, re-written, and developed over a five-year period and, like many of the studio's animated efforts, represents a lighter, family-friendly adaptation of somewhat darker source material. Its extremely accessible cycle-of-life story is populated by likable characters, peppered with moments of joy, tragedy, and renewal within a short window of several years. But perhaps its most defining characteristic is, not surprisingly, the top-tier animation and stunning, watercolor-infused landscapes that bring its world to vivid, realistic life. 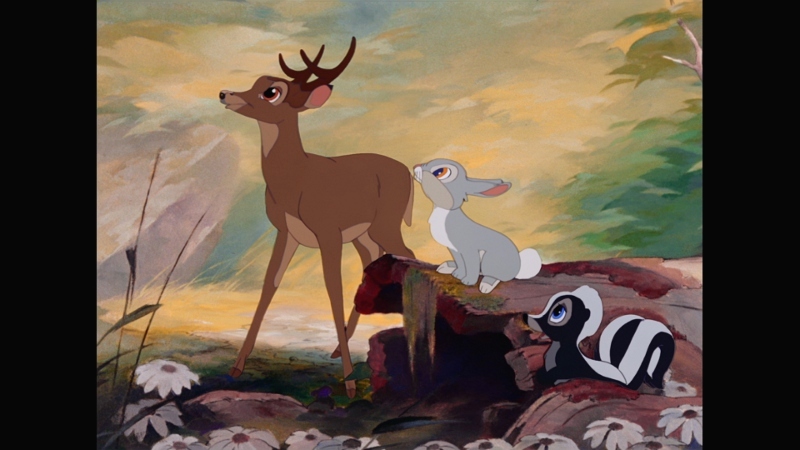 Laying acres of new groundwork in its striking depiction of smoothly animated wildlife that would later be mirrored in future classics like 101 Dalmatians, Lady and the Tramp, The Jungle Book, The Lion King, and countless others, Bambi remains a visual achievement that still plays perfectly well for audiences of all ages. OK, maybe six and up, unless you buy tissues at Costco. Bambi has also enjoyed no shortage of home video releases over the years, including a handful of VHS editions and, more recently, a 2005 Special Edition DVD and a Diamond Edition Blu-ray exactly six years later. 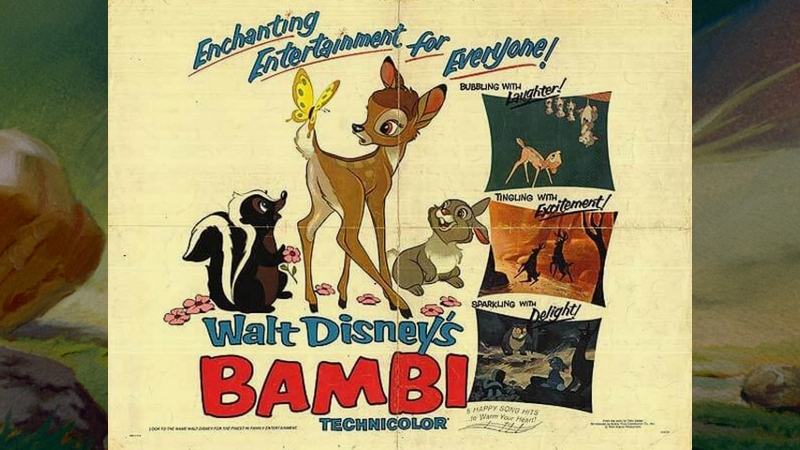 And, like many of the studio's Blu-rays, Bambi was recently vaulted and has now been reissued as part of their "Signature Edition" line, which typically recycle existing high-def transfers and mix in new bonus features with most of the old ones. I'd rather they get around to releasing the dozens (hundreds?) of feature-length films and shorts that haven't yet made the jump to digital home video, but at least those who don't own Bambi on Blu-ray yet can get it a little easier. Do yourself a favor and pick up the sequel as well---it's better than you'd expect, and Patrick Stewart's in it. Disney's previously issued Diamond Edition Blu-ray looked outstanding, so don't get too upset that this appears to be the exact same transfer as that one (albeit one that's be re-encoded and compressed with slightly more content on a single Blu-ray). The smooth, watercolor palette absolutely pops off the screen, image detail is striking and, most importantly, digital imperfections don't seem to be an issue at all. Those familiar with Disney films of this era should know what they're getting, but this film really does look that good. It's even better in motion. Also identical to the last release, audio options include DTS-HD High Resolution 7.1 (unfortunately, still not lossless) and Dolby Digital 2.0, along with French and Spanish dubs. The 7.1 option might seem like overkill for a 1942 film, animated or otherwise, but this is a tasteful and effective remix that adds mild channel separation, rear effects, and a bit of low end when the situation demands it. I'd probably pick the original 2.0 mix if forced to choose (even though it's DVD quality), but having both options is nice. Purists will flock to the original mix too, and for good reason: it's still clear as a bell, with crisp dialogue and music cues to boot. Optional English, SDH, Spanish, and French subtitles have been included during the main feature and all appropriate supplements. The simple interface is cleanly designed and easy to use, providing separate options for chapter selection, setup and bonus features. This two-disc (BD+DVD) set is housed in a standard dual-hubbed keepcase with attractive cover art and a matching slipcover. In what must be a microcosm for this release in general, we get a handful of ad inserts but no actual booklet like last time. Oh, and there's also a Digital Copy redemption slip, if that floats your boat. New to this release: A few recent and vintage goodies. The older material leads off with "Studio Stories: Bambi" (4:56), which pairs a few 1956 Walt Disney audio interview segments with concept art, sketches, and other vintage material for the film. Two Deleted Scenes ("Bambi's Ice and Snow" and "The Grasshopper", each with introductions by animator Floyd Norman, 7:26 total) are here as well, presented as a partially animated storyboard sequence. Finally, Oswald The Lucky Rabbit: "Africa Before Dark" (5:50) is a 1928 animated short co-directed by Walt Disney and Ub Iwerks, originally thought to be lost until a full copy was discovered less than a decade ago. Two lightweight and more modern new extras are here as well. "The Bambi Effect" (3:01) is obviously too short to go into much detail, but offers a quick overview of the film's massive influence on later Disney animation. Finally, "Bambi Fawn Facts" (3:34) serves up a handful of trivial tidbits about the real-life animals featured in the film. Carried over from the Diamond Edition: Plenty of great material including "Inside Walt's Story Meetings: Extended Edition" (95:55), two Classic Deleted Scenes (5:39), one Deleted Song - "Twitterpated" (1:52), mid-length featurette "The Making Of Bambi: A Prince Is Born" (53:15), a "Tricks Of Our Trade" Excerpt (7:18), "Inside The Disney Archives" (8:39), The Old Mill Animated Short (8:58), "The Golden Age" (6:24), and the film's Theatrical Trailer (2:12). Gone, but not forgotten: Three different introductions (by Patrick Stewart, animator Andreas Deja, and Diane Disney Miller), a "Virtual Forest" screensaver, a handful of disc-based games, a read-along story and interactive quiz, a short "Restoring Bambi" featurette, an interesting "Disney Time Capsule" featurette, and a photo gallery. Disney's habit of vaulting perfectly good Platinum and Diamond Edition Blu-rays---only to replace them with side-stepping double-dips---continues with this new "Signature Edition" of Bambi, their undisputed 1942 classic that every self-respecting Disney fan has owned on at least one home video format or another. Quite simply, it's a timeless tale that holds up perfectly well today. Serving up the same pitch-perfect A/V presentation as their earlier Diamond Edition and another enjoyable (but not definitive) collection of supplements, this new combo pack is a no-brainer for those who didn't grab Bambi on Blu-ray while it was still available and, for obvious reasons, comes firmly Recommended. Everyone else, aside from the most rabid Disney collectors, can probably skip this one.